Sometimes the best locker for your gear is one that’s got a combination of easy access plus security. That’s what the XPB Solid Plastic Open Access Gear Lockers provide for your athletic team, police or fire department. These lockers are perfect for any application where some security is important, but total lockdown top to bottom isn’t mission-critical. This locker style offers a large, open section at the middle where users can set down gear and bags. Jackets and uniforms can also hang from hooks that are securely mounted on the back and side of the open space. Locker sides offer a division of space between one locker and the next. But the open front design of the midsection means everyone can access some items, such as outerwear, quickly, without operating a lock. The XPB Locker durable plastic material isn’t just tough, it’s available in 17 different colors and textures. Choose from earthy neutrals, deep colors such as burgundy or hunter, faux stone or decorative textures such as “Starry Night” for a locker area that looks as good as it performs. 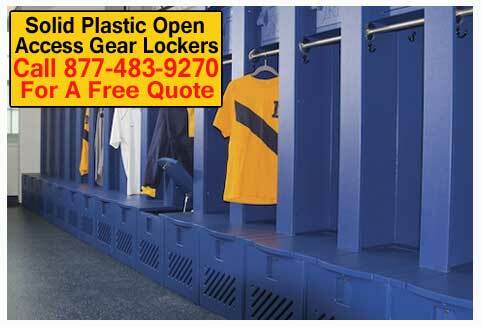 Call us at 877-483-9270 for a free quote on your Open Access Gear Lockers.